This book is part of the SPFBO. I am not a huge reader of young adult books. I kind of feel like when the young adult dystopian craze kicked up, that’s a train that just passed me right on by. I never really enjoyed it as much as I think I was supposed to. It’s not that it’s not good, some of it is great, it’s just not really my flavor of read. This isn’t quite a dystopian read, though it does have some notes of it. A society full of secrets and subtle tension, people on the brink, people being controlled, characters who are thrust into the center of something big but don’t quite see the form or shape of it yet. Young protagonists who are growing up in the middle of a stew of complexities. The notes are right. In Sowing, the book opens up with a prologue, which, as all good prologues do, confused me as much as it intrigued me. The rest of the book, however, is told from first-person perspectives, those of Ariliah and Rabreah, sisters, and while they share a kinship, both ladies are completely different. This really worked in the book’s favor. Rabreah has a more minute, intimate and detailed look at the smaller, closer aspects of the world, while Ariliah is where I really started to see the big picture of things, and how all of this fit together. The first few chapters were a bit confusing. A lot of characters were introduced in a very short period of time, which made it a little difficult to figure out who was who and why they were doing whatever it was they were doing. Too rushed, perhaps, with introductions, which had the odd effect of making the start feel kind of slow. That being said, it evened out after that and the author really hit her stride. Things started to make sense. 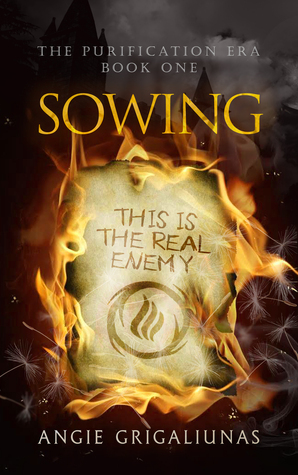 Sowing is a sorting hybrid thriller and political intrigue novel. Through the perspectives of Ariliah and Rabreah, we get a really good picture of how things are – both the positive aspects of their lives (safety, security, order) and the negatives, which are slowly revealed as the book gets underway. The boiling, looming conflict between the Hulcondans, those who heft the political power and the rebels, who are working, subtly, toward change in the status quo. Mixed into this is the Itzalin, a race of otherworldly creatures who are determined to wipe out humankind, and are only held at bay due to the Hulcondans. It’s an interesting stew that readers are thrown into, and it simmers until it reaches a boil, and what a boil it reaches. The dueling perspectives of our very, very different protagonists, and their different insights and goals really help readers get a pretty grounded, well-rounded insight into what is happening, as well as all the nuances therein. There is also a slow building of tension and intrigue that just really worked for me. The writing is quite wonderful, superbly edited, and I have to say I love the cover art. Despite the clunky, sort of awkward start, and a cliffhanger at the end that readers will either love or hate, this book was very well thought out, wonderfully written, and incredibly gripping. Grigaliunas really surprised me here. I went into this book thinking that I wasn’t really going to like it, and I ended up reading it in a weekend and ending up completely surprised by just how captivating it ended up being. I think fans of young adult books would be fools to pass this one over. Ahh thank you!! So glad you enjoyed it!